MIT researchers are making transparent solar cells that could turn everyday products such as windows and electronic devices into power generators—without altering how they look or function today. How? Their new solar cells absorb only infrared and ultraviolet light. Visible light passes through the cells unimpeded, so our eyes don’t know they’re there. Using simple room-temperature methods, the researchers have deposited coatings of their solar cells on various materials and have used them to run electronic displays using ambient light. They estimate that using coated windows in a skyscraper could provide more than a quarter of the building’s energy needs without changing its look. They’re now beginning to integrate their solar cells into consumer products, including mobile device displays. Three years ago, a team in MIT’s Organic and Nanostructured Electronics Laboratory began to tackle the problem using a different approach. Richard Lunt, then an MIT postdoc and now an assistant professor at Michigan State University, proposed making a solar cell that would absorb all the energy from the sun except the part that allows us to see. All light is made up of electromagnetic radiation spanning a spectrum of wavelengths, each containing energy that potentially can be harvested by a solar cell. But the human eye can detect only part of that spectrum—the so-called visible light. With the right materials and design, the light that we can detect would pass through the solar cell to our eyes; the rest would be absorbed by the solar cell—and we’d never miss it. 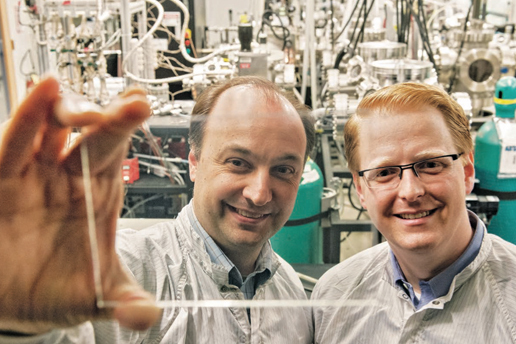 Inspired by Lunt’s idea, the team developed a transparent PV cell. The schematic figure below shows its components and how they work together. The thickest layer (toward the left) is the glass, plastic, or other transparent substrate being coated; the multiple layers of the PV coating are toward the right. At the core of the coating are the two active layers—the absorptive semiconductor materials that get excited by sunlight and interact, creating an electric field that causes current to flow. Sandwiching those layers are electrodes that connect to the external circuit that carries the current out of the device. Since both electrodes must be transparent—not the usual reflective metal—a layer on the back of the cell can be added to reflect sunlight of selected wavelengths, sending it back for a second pass through the active layers. Finally, anti-reflective coatings can be used on both outside surfaces to reduce reflections because any light that reflects—potentially as much as 10% of the total—doesn’t go through the device. “We use a combination of molecular engineering, optical design, and device optimization—a holistic approach to designing the transparent device,” says Barr. This schematic diagram shows the key components in the novel transparent photovoltaic (PV) device, which transmits visible light while capturing ultraviolet (UV) and near-infrared (NIR) light. The PV coating—the series of thin layers at the right—is deposited on the piece of glass, plastic, or other transparent substrate. At the core of the coating are the active layers, which absorb the UV and NIR light and cause current to flow via the two transparent electrodes through an external circuit. 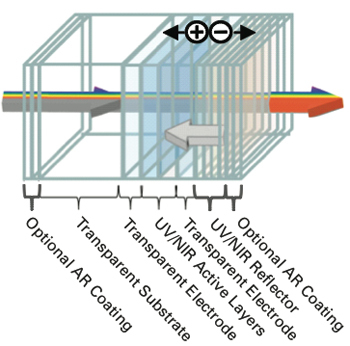 The reflector sends UV and NIR light back into the active layers, while the anti-reflective (AR) coatings on the outside surfaces maximize incoming light by reducing reflections. To demonstrate the operation of their solar cell, the researchers measured its absorptive response and then compared it with that of a conventional solar cell. The results appear below. In each case, the absorptive response (black curve) is superimposed on the solar spectrum (gray curve). In the conventional cell (top), the wavelengths at which absorption is relatively high include the visible part of the spectrum that our eyes can detect (the colored section between about 400 and 700 nanometers). In contrast, the transparent cell (bottom) absorbs well in the near-infrared and the ultraviolet parts of the spectrum—both above and below the visible range. But in the visible region, absorption drops off, approaching zero. Current versions of the team’s cells transmit more than 70% of the visible light, which is within the range of tinted glass now used in the windows of buildings. But their power-conversion efficiency is low—only about 2%. In a detailed theoretical analysis, Lunt, Bulović, and others showed that their design should realistically be able to reach over 12% efficiency, a rating comparable to that of existing commercial solar panels. Getting there will be a challenge, but they believe they can do it by carefully optimizing the composition and configuration of the PV materials. Indeed, says Lunt, by simply “stacking” their transparent solar cells, they could potentially reach an efficiency of 10% while still maintaining the ability to transmit light. Already they have demonstrated that an array of transparent cells integrated in series can power the liquid crystal display on a small clock, relying entirely on ambient light. One remaining challenge is longevity. In commercial applications such as window coatings, the solar cells need to continue performing well for many decades. According to Bulović, work to extend the lifetime of related products, such as LEDs, has made good strides. With many industries tackling the same issue, he believes that this engineering problem should be solved in the coming years, and their solar cells should be guaranteed to have a commercially viable lifespan. The cost of implementing the technology will vary with the application, solar cell efficiency, and other factors. But Barr cites several sources of potential cost savings over traditional solar systems. For instance, the processes used in fabricating the new transparent PVs are environmentally friendly and not energy intensive. Indeed, the coatings are deposited at nearly room temperature, so the transparent PV can be laid down on essentially any type of surface. There’s no need to use glass, which is a costly component in the fabrication of conventional systems. Even more significant savings could come during installation—often a benefit of “piggybacking on existing infrastructure,” says Barr. To illustrate, he refers to PV-coated window glass. During new construction or a window-replacement project, the PV coating could be added for very little extra cost. The coating could easily be deposited on one of the inner surfaces of double-paned windows, along with standard low-emittance or solar-control coatings. The PV layer would be encapsulated between the panes, well protected from weather, window washing, and other outside threats. More important, the glass, framing, and installation costs would be included in the overall cost of the construction project—the same with or without the PV coating. In contrast, when using a conventional PV system, those costs can make up half to two-thirds of the total. Distributing the energy generated by the PV-equipped windows could be as simple as placing a wire connection, power electronics, and an outlet at the side of each window or series of windows. The benefits from adding the solar cells should be significant. The windows in a skyscraper, for example, provide a vast vertical area directly exposed to the bright morning and early evening sunlight. In one analysis, the research team calculated that if all those windows contained the transparent solar cells—assuming just 5% efficiency—the power generated could fulfill more than a quarter of all the electricity needs of the building. Moreover, the solar cells would block much of the infrared radiation, a large part of the sunlight that heats up a room. That effect could cut down on air conditioning needs, further reducing energy use and operating costs in the building. And all of those benefits would be gained without modifying the look of the building or obstructing views for the occupants. Recognizing the commercial potential of this technology, Barr, Lunt, Bulović, and Bart Howe co-founded a company called Ubiquitous Energy, a name that reflects their vision of PVs seamlessly deployed throughout our everyday life. They are continuing development work to optimize their transparent PVs, using different semiconductor materials and device configurations that will lead to higher efficiencies and better transparencies. And they are figuring out how to integrate the PVs into consumer products that will perform their usual functions and harvest energy at the same time. Barr expects to have their first commercial products—for mobile electronic devices—ready within a few years. Enabling such devices to gather energy from ambient light and recharge their own batteries will provide significant benefits, including added convenience, greater freedom from the power grid, and a better user experience. Perhaps more important, in the process of developing products for mobile devices, the team will learn how to make larger energy-harvesting systems so that a few years later they can scale up their techniques to the size of windows. Bulović recognizes that their technology is not going to save the planet by providing all the emissions-free energy it needs. But he deems it an attractive part of the solution. It can be added to things that are already being deployed, and it won’t require devoting vast new areas to collecting solar energy. With this technology, those areas already exist in the surfaces all around us. R.R. Lunt and V. Bulović. 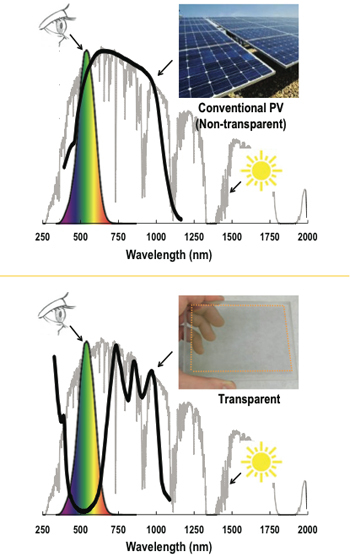 “Transparent, near-infrared organic photovoltaic solar cells for window and energy-scavenging applications.” Applied Physics Letters, vol. 98, no. 113305, 2011, DOI:10.1063/1.3567516. R.R. Lunt, T.P. Osedach, P.R. Brown, J.A. Rowehl, and V. Bulović. “Practical roadmap and limits to nanostructured photovoltaics.” Advanced Materials, vol. 23, pp. 5712–5727, 2011, DOI: 10.1002/ adma.201103404.